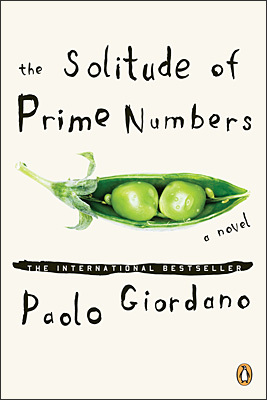 I love prime numbers. To me they symbolize independence - "I don't need any of you divisors to stand strong as my own number!" When Dad was celebrating his 61st birthday a few years ago, he felt as though it was a bit of a let-down after his 60th the year before, until I pointed out that he had to celebrate a prime year, as another one won't come along until he reaches 67. So it was the title of this book that attracted me. This book tells the story of two societal "misfits" who meet in high school, and stay friends into their adulthood. Alice suffers a skiing accident and ends up with a lame leg (though speaking as a physiotherapist, I don't see how a fractured fibula could result in the degree of disability Alice develops - it isn't part of the knee joint and isn't normally a weight-bearing bone), then subsequently develops a severe eating disorder and withdraws from her family. Mattia is traumatized by the disappearance of his twin sister (by his own fault), and develops self-mutilating behaviours and is possibly somewhere along the autism spectrum disorder, as well as being a mathematical genius. He is the one who considers himself and Alice to be prime numbers, possibly twin primes (two prime numbers separated only by one other number - e.g. 11 and 13, or 17 and 19). Interesting concept, but unfortunately it didn't live up to my hopes. I found the vagueness to be annoying at times - Alice has an unspecified disability, her mother is dying of an unspecified illness, Mattia moves to an unspecified university. And the book just ends, with no resolution - just people drifting through space and time. I also found the characters to be very two-dimensional (though this was probably compounded by the fact that I started it just after finishing The Diviners with such strong characters) and therefore hard to care about. It was an easy read, and tugged at my heart at times, but unfortunately not a favourable overall impression.